This is an update of a piece I wrote in 2010. Charles Darwin, Shrewsbury’s most famous son, was born in 1809 in this handsome border outpost within an almost circular loop of the River Severn. I took the train to one “England’s finest Tudor towns” and one of England’s most appealing day trip and short break destinations. I imagine E.M Forster sent his characters north to Shrewsbury “the astonishing city” in Howard’s End 100 years ago on a train just like mine. All that was missing was his “low rich purr” of a steam engine. Another favourite line, the epic 121 mile route from Swansea ends here too. But there are good connections from all over. in under 16 hours. The Lion’s owners started the service a few years earlier. floors, big old beds and the magnificent Tudor fireplace. Britain, became one of the first archaeological visitor attractions. town’s suddenly sloping streets, its ancient passages and crooked ways – the ‘shuts and passages’ (crooked medieval alleyways that criss-cross the town centre). ploy since taken up nationally. 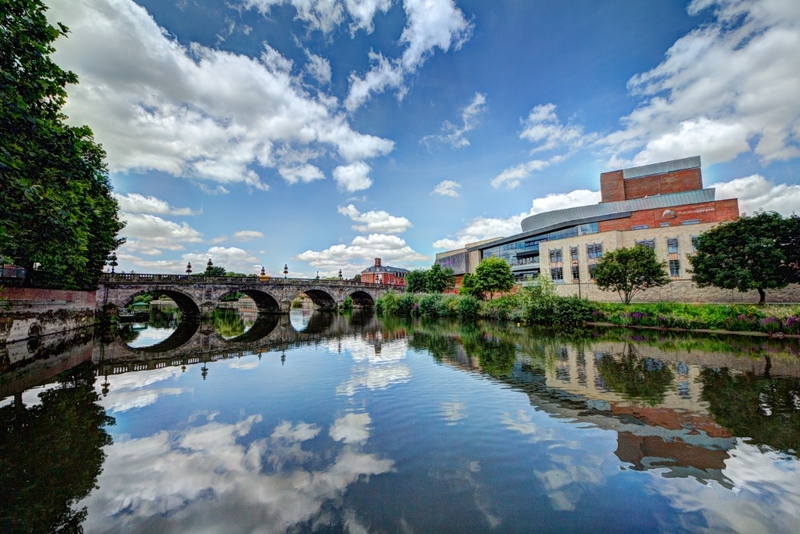 Shrewsbury has two principal bridges across the River Severn, the English and Welsh bridges, gateways to the town. The first English bridge, medieval, was replaced in 1769, but altered again due to changing water levels. The present bridge, a masonry arch viaduct, was built in 1926. The Welsh Bridge, on the other side of the town, is still on English soil. It is simply closer to Wales. Frankwell Foot Bridge, a cable-stayed steel box girder bridge supported from a concrete tower. It appears to bounce as you cross. The Porthill Bridge connects Porthill with The Quarry and the town centre. It also experiences significant vibration, even when only a few people are crossing it. The Kingsland Bridge may be the cheapest toll bridge in the UK – at just 20p to cross. It is also known as the Penny Bridge. Greyfriar’s Bridge (the 1880s) replaced a ferry between St Julian’s Friars and Coleham. Shrewsbury’s Railway Station Bridge, built in 1838 to carry the Shrewsbury to Wolverhampton line over the Severn. The iron was cast at nearby Coalbrookdale. Also the Telford Way Bridge and the Castle Walk Footbridge . on the river, to the park local boy, later BBC Gardener Percy Thrower tended when he worked here. (He is responsible for The Dingle in the Quarry, Shrewsbury’s, 29-acre parkland, encircled by a loop of the river Severn.). nothing to do it with”. His statue has stood outside the town’s library (his former school) since 1897. There are some striking monuments to the man – the Darwin Gate with its clever alignments, and the remarkable 40 feet Quantum Leap, marking the 200th anniversary of his birth in 2009. In the Shropshire Regimental Museum inside Shrewsbury Castle are collections of pictures, weapons, uniforms and memorabilia from the 1700s to today. Shrewsbury Museum & Art Gallery re-opened at the old Music Hall in 2014. The galleries: Roman, Shropshire, Medieval, Tudor and Stuart galleries. On display are Shropshire finds such as Roman tombstones and headstones and the Shropshire Mammoth. There is also a fine Tudor collection. Built in 1596, Shrewsbury’s Old Market Hall was restored and re-opened as a contemporary cinema and bar in 2004. Find the town’s award-winning indoor market beneath the clocktower. Look closely at some of the buildings on the High Street and see if you can spot Margaret Thatcher, Michael Heseltine and Mick Jagger. The Shrewsbury & Ironbridge sightseeing heritage tour starts on March 3rd 2019.